Martinique vacation will make you fall in love with the island's French charm with a tropical twist. Martinique, a fast-growing Caribbean vacation retreat is an overseas department of France, one of the islands in the Lesser Antilles, is known for its alluring beaches, superb cuisine, exclusively sophisticated resorts and hotels, enticing landscapes, a vast cultural heritage and a special chic twist to local speech, music and the tropical atmosphere. Water sports, sightseeing tours, historical excursions and various fun and exciting attractions are all in abundance here in Martinique. Pack your swimwear, sun lotion and a camera to capture the most captivating and thrilling journeys in this remarkable French jewel! Bon voyage! Why go on Martinique vacation? Who wouldn't want to experience a little France on one of the Caribbean's most fantastic and enchanting islands? Martinique has got something other Caribbean islands do not. Once you land on the island to experience your Martinique vacation, you will dive into fresh aroma of local, mouthwatering cuisine and the warmth in hospitality. Learn a few words en Francais - locals love to see visitors become a part of the island while they are here on vacation. Even though Martinique is part of France, it has its own vibrant personality and tropical ambiance that you wouldn't be able to resist. 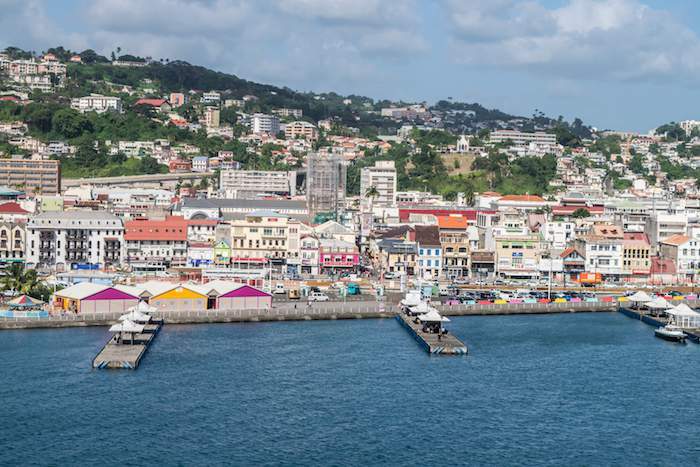 Martinique's capital city Fort-de-France, the largest town, is a definite gem to explore. The narrow streets, cozy cafes and shops with a French taste will please anyone's palate. Aside from fun and engaging water sports, sightseeing and historical tours of the surrounding nature, monuments, Cathedrals, a semi-active volcano and exceptionally unique attractions, Martinique offers some of the best things to do! Fonds Blancs, a large pool located right inside the Caribbean sea is a must-see wonder. 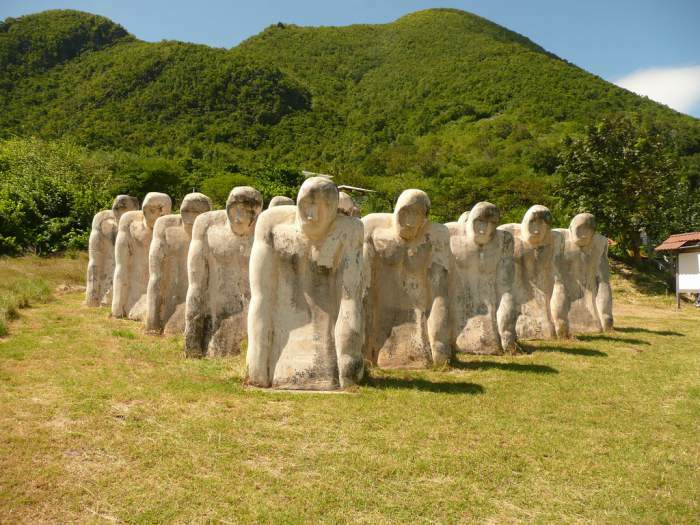 Le Memorial de l'Anse Cafard, a slave memorial, will teach you the extensive history the island holds, while kids can meet the animals from all around the world at the Zoo de Martinique. Taste the local flavour of rum at the Distillerie J M or just relax in the private Jardin de Balata, a gorgeously blooming botanical garden. Martinique vacation is infused with love, romance, fun and sophistication, delicious French food, entertainment and traditions. Your next vacation should be a one of a kind trip to the magnificent Martinique! There are no really high and low seasons in Martinique, as the island boasts warm and pleasant weather all year-round. However, if you want to evade from the big crowds of tourists, go on Martinique vacation sometime in May or June. This is the perfect time to savour more moderate and affordable hotel prices while still getting the best out of Martinique with its gorgeous weather of 27 degrees Celsius (80 degrees Fahrenheit), fun attractions and exciting tours. Be aware that summer months are prone to potentially strong hurricanes, so plan your trip researching the weather during your visit here. September and October are renovation months, and a few hotels and resorts shut down for maintenance, keep that in mind. If you long for a more quiet time, book your Martinique vacation in November or early December. Hurricane season is almost over with small chances of light showers; the sun and the sea are great for swimming and getting that perfect tan, and mass tourism doesn't start until the middle of December, so you are sure to enjoy your trip in peace and seclusion. Where is Martinique on the map? Martinique, a small overseas French territory is nestled in the middle of the Lesser Antilles. 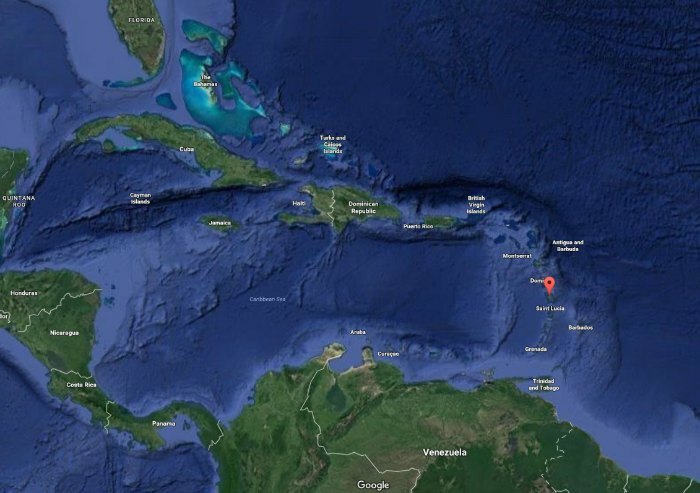 It is located right between Dominica and St. Lucia, with 93.7 km (58.2 miles) south of Dominica and 81.5 km (51 miles) north of St. Lucia. Martinique is just a little smaller than New York City with an area of 80.5 km (50 miles) long and 35 km (22 miles) at the island's widest point. This truly one of the most enchanting Caribbean destinations is home to many gorgeous exotic flowers like flamingo flowers, wild orchids and hundreds of varieties of hibiscus. The island's north part with rugged cliffs and rich vegetation also has the most inviting beaches with jaw-dropping scenery that will amaze you to the point where you wouldn't want to leave. If you go to the south side of the island during your Martinique vacation, expect to find sugarcane plantations. This area is also made of rolling steep hills, a true beauty of nature to admire. Fort-de-France, the political capital of Martinique is the largest city in the French Antilles. Fort-de-France, with its population of almost 100,000 residents, serves as a commercial center as well as a large export site of sugar, cacao and rum. The fascinating town opens up its doors for many exciting places to visit such as Chapels, Cathedrals, beautifully designed Churches with gorgeous hand-painted murals, blooming parks and rain forests, fountains, an old library and much more for visitors to discover on Martinique vacation. Fort-de-France is located on the west coast of Martinique, at the northern entrance of the large Fort-de-France Bay with 3 main forts: Fort Gerbault, Fort Desaix and Fort Tartenson. Well-kept, alluring, with its own history and the most mesmerizing surroundings the city is an overseas department of France. But once you take a trip to this little gem of Martinique, you will dive into a real tropical oasis. The old yet quite modern capital of Martinique is full of many captivating historical and memorial sites, lush green landscapes, thrilling tourist attractions and a lot more to see. Pass through for some shopping and peak into the nearby markets, museums and the historic fort, this city is definitely worth a visit during your Martinique vacation. Estimated population in Martinique in 2016 is 396 650. Although this island is still growing in prosperity, its tourism industry has greatly expanded over the last few years. Ethnic groups in Martinique mainly consist of African and African-white-Indian mixture residents, white inhabitants and other ethnic groups that combine less than 5% of total population. Approximately 85% of Martiniquais are Roman Catholics, which is considered as predominant religion on this French island. Other religious denominations include Methodist, Evangelical, Jewish, Hindu, Muslim and Seventh-Day Adventist. Martinique, an overseas region of France, is a french-speaking island, and a lot of residents do not speak nor understand English. English language is more often used in tourist concentrated areas such as hotels, restaurants and attractions. But even then, be prepared to learn a few words and phrases in French as you prepare for Martinique vacation, as some tour guides and service staff do not speak English. 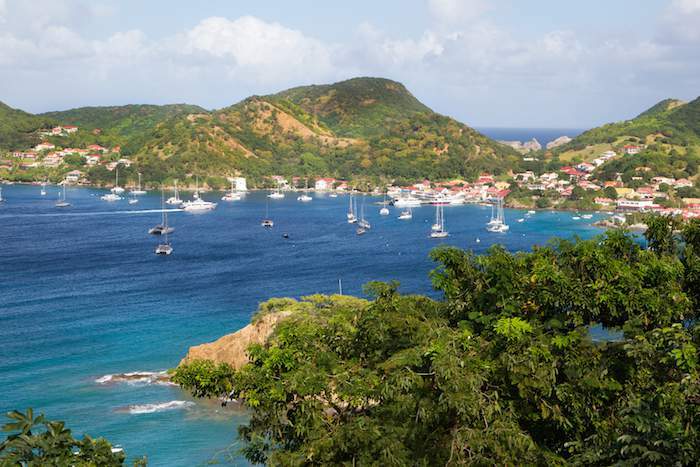 Although French is the official language of Martinique, french-speaking visitors will need some time to become accustomed to the island's local flair and sounds of the language. A native creole has been engrained in and influenced into the French spoken here, but this type of dialect is more used in informal settings or among family members. French is the language of instruction in Martinique in all Government operations, schools, hospitals and media. Menus in the restaurants are all written in French, and if the patrons are having a difficult time understanding the menu and the list of dishes and drinks, a waiter will be more than happy to help out. If you are an English-speaking visitor, try to learn a few words and phrases in French. Martiniquais love to see visitors' respect and appreciation of their motherland, local customs, traditions and the language, and will be more than happy to reach out a helping hand. A pocket dictionary will become handy at times when speaking French in Martinique will become a real struggle. Martinique Aimé Césaire International Airport is a relatively small but easy to navigate through airport that is located a short 15-minute drive from the capital, Fort-de-France. It accepts large international aircrafts daily and offers many amenities such as food outlets, shops, restaurants, car rental agencies and much more on its premises. American Airlines is the first and at the moment the only American airline carrier that offers nonstop flights to the island of Martinique departing directly from Miami. Norwegian Airlines provide direct flights from Boston, New York, Washington and Baltimore, while Air Canada services Martinique from Montreal only. Those travellers flying out of Toronto would need to make a transit stop in one of U.S. major cities on in Montreal. European passengers may also travel to Martinique directly from Paris, where a few of airline companies are ready to provide their service. If you are not taking a direct flight for your Martinique vacation, connections could also be made in Miami, San Juan (Puerto Rico) or in one of the neighbouring Caribbean islands. Guadeloupe also offers direct flights to Martinique as well as a ferry service. Some inter-island aircrafts provide their service flying directly to Martinique from either St. Maarten, St. Barth or Santo Domingo in Dominican Republic. Ferry service is readily available between Martinique and the nearby islands of Dominica, Guadeloupe and St. Lucia, but check their timetables in advance as the boat service may not run daily or on a consistent schedule. There are so many lodging options in Martinique that virtually any tourist will find their perfect spot to enjoy the vacation on the island. Along with Parisian elegance and Caribbean-style resorts and hotels, the selection is endless, just choose what best suits your needs, preferences and affordability. Large resorts in Martinique are located on deluxe properties and offer a unique mixture of hospitality, charisma and a wild feel, that a lot of French just love. Each resort offers its own amenities that are either included in the final package price or are at extra cost. These extra perks include meals, resort activities, tours and attractions. Some but not all Martinique resorts also offer all-inclusive packages, that many travellers prefer when travelling to Caribbean destinations. All-inclusive deals are perfect for families with kids or for those that want to eliminate the need to prepare a detailed budget, while paying a fixed price. Inquire at the hotel of your choice what is included and what is extra to plan your Martinique vacation accordingly. Relais Creoles are small, individually owned inns that offer that welcoming hospitality, coziness and comfort, but they are located much further from the main resort areas, so a car might be needed. For those that are visiting the island with a group of friends or family and are looking to save, are welcome to rent out one of the luxurious villas. If you are planning on exploring the island, basic French communication skills will be needed. Whether it is an exclusive hotel, a luxury resort, a secluded villa or a country inn, a condo or an apartment complex, a hostel, a bungalow or even an eco camping site, there is a selection of Martinique vacation options for everyone. Pick your best choice and be on the adventure of a lifetime. There are really no "seasons" in Martinique as yearly temperatures stay pretty much in the same range throughout the year, with slight variation of about 5 degrees. The peak season begins in mid-December and continues through mid-April, and if budget is not an issue, this is the perfect time to enjoy hot and sunny weather, endless activities and a total pampering head to toes during your Martinique vacation. January tends to be the coolest month of all, with temperatures of 22-28 degrees Celsius (72-82 degrees Fahrenheit). February through April temperatures stay between 21-29 degrees Celsius (70-85 degrees Fahrenheit) with March being the driest month. The off-season in Martinique begins in May and lasts all the way through the beginning of December. Temperatures during this time are perfect for tanning and just enjoying your time under the sun on the warm silky-sand beach. Normally, during this period, temperatures are from 22-32 degrees Celsius (72-87 degrees Fahrenheit) with high chances of precipitation, but that doesn't stop many tourists to vacation in Martinique as the island becomes quiet and more affordable. Summer and fall months are considered a hurricane season in all Caribbean region, and even though hurricanes rarely occur in Martinique, they can be devastating if they end up hitting the island. Check the weather forecast prior to your trip to ensure a safe and pleasurable Martinique vacation. Buses in Martinique are a great alternative to taxis and car rentals as they are much more affordable and are perfect for short distances if you need to get to your destination in a timely manner during your Martinique vacation. Bus stops are square blue signs with a picture of a bus in white. Travelling by bus is not too popular in Martinique, as a lot of residents own cars. There are more cars registered in Martinique than in France, that is why roads are always blocked with traffic jams and parking is hard to find. Although there are larger public buses in Martinique, most buses are small minivans, that are marked as "TC". Bus service on the island can be quite unpredictable as a lot of the times it doesn't run on a schedule, so waiting times can be unreliable either. Taxi service in Martinique is quite expensive, and in order to avoid excessive charges, try to use them when absolutely needed, otherwise opt for some public transportation or a car rental. Ferry service is readily available as well, but only if the weather permits. Ferries operate daily between Fort-de-France and Pointe du Bout. Vedettes (ferries) are considerably short trips about 20 minutes each way and depart every 30 minutes in the high-season. Low season and weekends' schedules may vary, so gather this information in advance. Renting a car in Martinique can bring both the hassle and enjoyment of exploring the island on your own during your Martinique vacation. Local drivers tend to drive aggressively and if you do not at least attempt to speak French, do not expect any sympathy from them. Although, Martiniquais are very friendly and polite folks, they drive fast and recklessly, you want to stay as close to them as possible in order to get to your destination. Traffic jams on the island occur throughout the day, especially during traditional rush hours and on Friday and Saturday evenings, due to parties and night outings, so plan your trip accordingly. Driving in Martinique is on the right-hand side, roads are kept in extremely good condition and are well-maintained, without potholes and bumps. A valid driver's license from your home country is required in order to operate the vehicle, and some car rental agencies have set the age limit to rent. The speed limit around the city is 50 km/h (31 m/h), while open roads are 90 km/h (56 m/h) and highways have speed limits of 110 km/h (68 m/h). Parking can easily be found if you are staying at a resort or a hotel. There has been a significant increase of vehicles on the roads in Martinique in the last few years, so due to heavy traffic, it could be problematic to find a good parking spot in the core of the city. One very important thing to keep in mind when renting a car during your Martinique vacation is that most of the rented cars have manual transmissions, so those travellers that are used to driving automatic must make a request for such prior to arriving. Euro is the official currency in Martinique, and although U.S. dollars are accepted in some hotels, is it advised to exchange them for Euros either prior to your Martinique vacation or in one of Martinique's banks and/or ATM machines. Be prepared that your bank might charge a fee for each foreign withdrawal, it might add up to a significant amount if this service is used on a regular basis, so try to exchange your money in one shot to avoid these unnecessary charges. Major credit cards are also accepted in a lot of popular hotels, restaurants and other major establishments in Martinique, but if you go further away from Fort-de-France and Pointe du Bout, it is better to have some cash handy as a lot of remote locations accept euros only. ATM machines provide fairly good and a lot of times the best exchange rates, so when you arrive at the airport, exchange your money there. Keep in mind, that the best way to go about during Martinique vacation is to rely primarily on credit cards if you are planning large purchases and euros for smaller cash purchases, but even then, try not to carry large amounts of bills with you, it might attract unnecessary attention. Prices in Martinique will appear a lot higher than usual, but just remember they include both the taxes and the tips. Tipping rules are the same as in France and most places already have the gratuity included into their final bills. All restaurants in Martinique include the 15% service charge in all of their bills, so tipping extra is not required. If you feel that the server went above and beyond in providing the top notch service to you, feel free to provide more gratuity to them. Although this will be very much appreciated, it is not expected of you, and the service will not change whether you leave an extra tip or not. Tipping hotel staff, maids, bellhops, taxi drivers, barmen, waiters isn't common in Martinique either. Everything is already included in the price, together with the 10% service charge the hotels and resorts charge, so check your bill carefully. Sometimes beach and street vendors can get quite intimidating in some parts of any tropical island, and Martinique is not an exception. Generally, local vendors are nice, friendly, and treat their customers and potential buyers with hospitality and kindness, but if you are not interested in purchasing anything, simply let them know. There are more private and secluded beaches around, where you will not get bothered by the vendors. Stretches of gorgeous white sands, local snack shops with the mouth-watering cuisine and a secluded paradise, make Martinique vacation one of the most desirable in the world. Safety is a very important aspect when it comes to your Caribbean vacation destination. When you go on Martinique vacationis a very safe island, but since it attracts a lot of wealthy and famous people, picket-pocketing in specific areas can be a problem. Watch how you carry yourself, do not be too flashy, leave your expensive items at home, and for those that you do end up bringing, use the hotel safe, they will be secured in there. Mosquitoes can be a problem in the Caribbean as well, and although you do not feel or hear them, they can leave some pretty itchy spots. Apply a bug spray in the evenings or wear appropriate clothing to avoid flu-like symptoms that can go on for almost a week, also called a dengue fever. If you are planning on exploring Martinique on your own, never walk alone at night, on unlit streets or far from main roads. Avoid wandering the backstreets of Fort-de-France after dark, mugging could become the main concern during the evening and night hours there. Manchineel trees, that are grown on the beaches, with a large number of them concentrated on the island's south coast, are dangerous. Please avoid touching them, coming around them, consuming their apple-like fruits or hiding under them from the sun. The milky substance that the tree contains can become fatal if contacted with the skin or swallowed. It cases severe rash and deadly burns. The tap water in Martinique is fully drinkable and is safe to consume and cook with. For those that have sensitive stomachs, it is not suggested to drink local water. If you are out and about exploring Martinique, equip yourself with a water bottle, and if you still feel thirsty or dehydrated, local cafes and supermarkets offer clean, purified and tasty bottled water for your convenience. Standard voltage in Martinique is between 220-240 volts with 50 cycles, and travellers from North America will require plug converters/transformers and/or adapters in order to use their electronic appliances and devices during Martinique vacation. Tourists from Europe will only need to bring their chargers and devices themselves, since Europe uses the same voltages as the island of Martinique.